Chun Yen (Larry) is our student from Taiwan. He has been with us for almost a year. He has already graduated from university with a major in international business. He would like to spend 1 year in the US to learn English. English is crucial for his career development since he will be coming back to Taiwan to work for his father company which is an international company. He had been in EC New York, EC Boston and EC Los Angeles before he came to EC Miami. He started to take ESL Courses in Miami with us since last July until now. Chun Yen shared with us that he had got a lot of difficulties during his first time in the US due to the language barrier. He couldn’t communicate with his roommate who is from Switzerland. He was not able to place an order when he wanted to buy food and drinks. He was afraid of speaking English. And guess what? 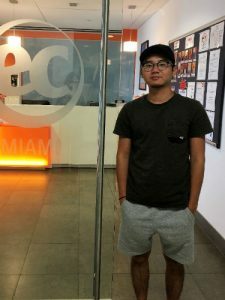 Just after 2 months at EC Miami, he became more confident in speaking. He could participate more in class and able to express himself in English. He can understand almost what people says. His listening and speaking skills are improving faster than he thought. He even does a lot of things by himself without any difficulties such as finding an apartment, renting car, booking hotel or reporting issues…etc. His most favorite class at EC is English in the City because he could know more about Miami. He often goes and explores new nice places after class or on the weekend. Next month is Larry’s last month in Miami, We do hope he will continue to enjoy the rest of his time here.